Hi Patty! You're absolutely right. There's something special about Nativity sets, especially ones with extra meaning. And I'm with you. Factual or not, the wise men will be standing next to it! Thanks for sharing. 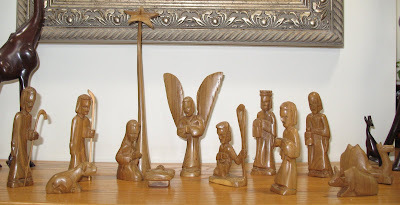 Thanks for sharing your Nativity sets, Patty. They are beautiful. I love nativity scenes, too. And even if the Wise Guys weren't there that night, they were still there when he was little, worshiping him, so I'm glad you include them. I do too. Love them ALL. Have two up this year, and I LOVE having them. I would have adored your children friendly Nativity set when I was little. I would have arranged them for hours. Wonderful Christmas post! Love your nativity scenes. Each one weaves its own story and memory. Thanks for sharing them with us. Wow, I love Nativity scenes too! Could go broke collecting them and crosses LOL!